If you have ever wondered about the main differences between POE (Point-of-Entry) and POU (Point-of-Use) water filters, then you have come to the right place. Understanding the main features and functionality of both types of systems is actually pretty simple, and it will give you a much better understanding about the types of home water purification options that are available. 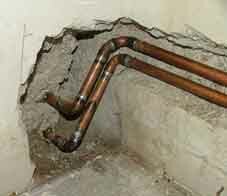 POE systems are installed at the main water line where water first enters the home. This entry point is usually found in the garage, and POE systems are most commonly placed in front of the water heater to deliver purified hot and cold water to every tap in the home. This is why they are also known as “Whole House Water Filters” because treated water is delivered to all sinks, baths, showers, dishwashers, refrigerators, washing machines and toilets – basically covering the whole house. POE systems offer high capacity filtration and can treat up to several thousand gallons of water per day. They are normally larger in size with smaller mountable units, measuring from 20”H x 4.5D”, to taller freestanding mineral tank systems that stand up to 65”or more in height. These versatile units can use a variety of different filter cartridges and media beds to practically remove any type of water contamination. The higher capacity & volume of POE systems also make them the most durable and maintenance free solutions, with some larger units only requiring filter replacements every 5-7 years. While whole house POE filters will produce high quality general purpose water, they are not ideal for producing ultra-pure bottled water quality. To enjoy the finest quality drinking water, it is best to install a POU reverse osmosis system. POU systems are installed at a single water connection typically under the counter of a kitchen or bathroom sink. These lower capacity, smaller systems will filter water at the actual “point” where it is being used. While POU purified water can be distributed to more than one outlet, the low volume production (20-100 GPD) makes it best suited for light use applications. Depending on the size of the unit, some POU filters will last only 3-6 months with others lasting up to 1 year or more. Examples of POU systems include under-counter and countertop reverse osmosis (RO) systems as well as basic sediment and carbon faucet filters. While most of these filters claim to produce drinking water, only reverse osmosis systems will deliver highest quality water that is suitable for drinking. This is because only RO systems use advanced hyper-filtration membrane technology to remove up to 99% of water contamination and produce bottled quality drinking water. Families that are looking for a complete solution for drinking, bathing and cleaning water will often elect to install a combination of POE and POU water filters to treat their entire home. A typical setup for people on city water may include installing a POE whole house backwashing carbon filter in the garage to remove chemicals and odors, followed by a POE water softener to reduce scale buildup, and completed by a POU reverse osmosis system in the kitchen for drinking and cooking water. Homeowners who are on well water or need specialized treatment will also find that there is a wide variety of treatment options available to address their specific water contaminant concerns.